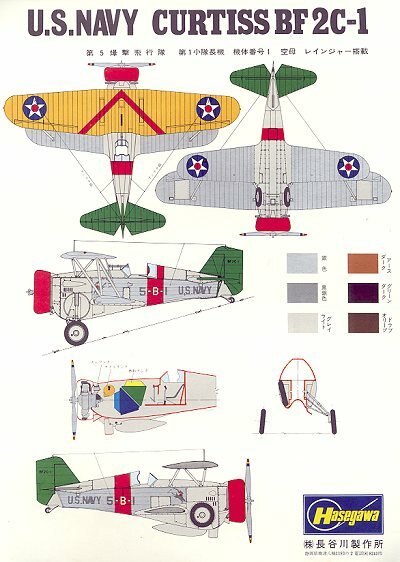 DECALS: Any BF2C-1 ever built! Let me quote from the instruction sheet for this. "TheCurtiss BF2C-1 was an advancement of the earlier F11C-1 Goshawk developed forthe USN in 1932. It was strengthened for dive bombing and a retractable landinggear was added. The first BF2C-1's were delivered on October 7 1934 and wereassigned to the USS Ranger (CV-4). The planes were flown by VB-2B (later changedto VB-5B) until 1937. By that time, the aircraft had become weakened by thecontinual stress of dive bombing." 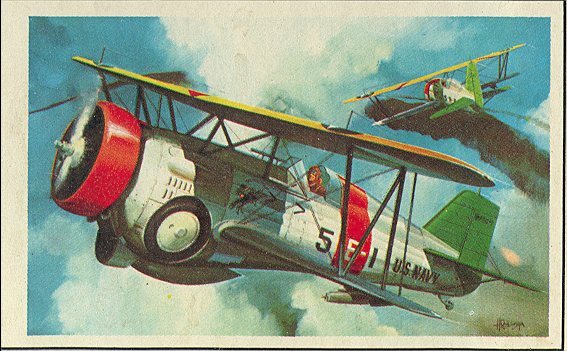 "As a result, wing flutter became a real problem and in1937 the service life of the BF2C-1 ended abruptly when a wing buckled andcollapsed during routine maneuvers. The remaining planes were surveyed (thatis Navy talk for withdrawn from service, ed.) and many were sunk in SanDiego Bay. However, export versions of this aircraft (which did not havemetal-covered wings) served successfully in China and Thailand for severalyears." Hasegawa hasbuilt a number of very good 1/32 kits. Unfortunately for the big scale buildersall of these kits are now over 30 years old with nothing new in site. TheCurtiss BF2C-1 is one of those kits from the 1930s that Hasegawa did produce.Others are the P-26 and P-12E, both equally nice kits. 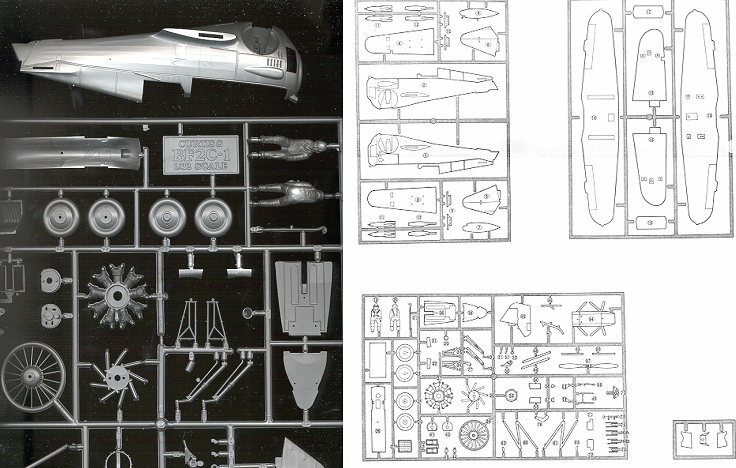 As one would expect from a kit of this era, there is little inthe way of engraved panel lines other than the control surfaces. There is nophoto etch, no resin and no vacuformed canopy. Just regular old polystyreneplastic! Detailing on the kit is actually very good indeed. One has no problemdistinguishing between the metal and fabric covered parts of the aircraft. Therivets are in scale and you can find the stitching without trouble. The fabricdetail on the wings and tail section is well done and not heavy-handed as is sooften found. I have shown a selection of actual parts and the parts guide above. There is virtually no flash and I had to hunt to find two tinysink marks. There are a few ejector pin marks on some of the smaller parts, butshould be a simple job to remove. The cockpit is complete, but simple as werethe aircraft of the time. There is even a pilot should you want one. The engineis also well detailed with a separate crankcase/pushrod piece and a welldetailed accessory section. The instructions are very well done in 12 steps and include a comprehensiveguide to allow the builder to rig the aircraft. The decal sheet is quite largeand will enable you to do any BF2C-1 that was in VB-5B, the only squadron to flythem. Equally impressive is the color guide. It is in full color, includingmetallics. On the reverse side is a diagram explaining section cowling markingsand colors in case you want to do something a bit different from the example onthe box top. Unfortunately, it is in Japanese! There are also images of Thai andBolivian Hawk IIIs, an aircraft very similar to the BF2C-1. A very nice kit that gets reissued every once in a while. I haveseen this one built up and it is a real beauty. Something about the large scalereally makes these kits stand out! If you would like your product reviewed fairly and fairly quickly by a site that has over 1,000 visits a day, please contact me or see other details in the Note toContributors.